This is one of my kids favourite snacks. It’s very simple to make and is a good high protein snack. They are better when eaten right away as they tend to lose their crispiness over time. Preheat oven to 400 F. Drain and rinse chick peas. Mix to coat, in bowl with olive oil. Sprinkle in the seasonings (to your liking) and mix well. Place on baking tray and spread out evenly. Bake in oven for approximately 25 minutes until crispy. Enjoy! Chickpeas are a good source of cholesterol-lowering fiber, as are most other beans. 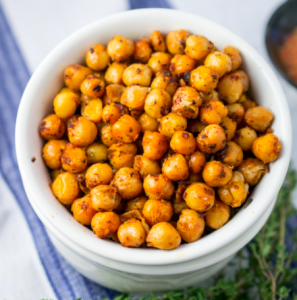 In addition to lowering cholesterol, chickpeas (garbanzos’) high fiber content prevents blood sugar levels from rising too rapidly after a meal, making these beans an especially good choice for individuals with diabetes, insulin resistance or hypoglycemia. When combined with whole grains such as rice, garbanzos provide virtually fat-free high quality protein that is easy to digest. Easy and delicious! They sure disapeared quickly.